A political action committee, that supports Senator Rob Portman’s reelection, have a TV advertisement running that says Ted Strickland joined a liberal special interest group that claimed members of the military are paid too much and praised the VA despite veterans having died while waiting for care. But is that really true? The claims are a misleading attempt at ‘guilt by association’ and ignores Strickland’s actual views and record on veterans issues. This entry was posted in Politics, Progressive and tagged 2016 US Presidential Election, campaign advertising, fact checking, false advertising, Governor Ted Strickland, Ohio, Senator Rob Portman, US Senate on June 8, 2016 by Doug. 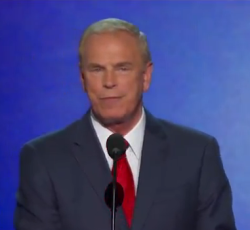 Although I am not watching the Democratic National Convention live this week I did check out the Tuesday night speech by former Ohio Governor Ted Strickland. I was impressed. Early speculation was he would attack current Ohio Governor John Kasich since he had spoken the first night of the Republican convention. Instead Strickland brought up one line of attack on Romney that I would like to see more of – attacking Romney’s patriotism because he has his money outside of the country. This entry was posted in Media, Politics, Television and tagged 2012 US Presidential Election, Democratic National Convention, Governor Ted Strickland, Mitt Romney, off shore, patriotism, President Barack Obama, speech, wealth on September 5, 2012 by Doug. The 2010 election is not official but it looks like a bad night for Democrats both nationally and here in Ohio. The economy was part of the reason – people out of work – blame the party in power. I have some other thoughts on it. It looks like the GOP will be sweeping all the offices in Ohio but at this hour Governor is still too close to call. MSNBC had some exit poll info that showed the main reason for turning out the Democrats was JOBS JOBS JOBS. Anger at the government (the Tea party argument) was only 24%. Genius Chris Matthews asks maybe if the Democrats had forced the GOP to fight for their ideas instead of letting them obstruct real economy recovery solutions and financial reform the results might have been different. You think Chris??? Duh! Where have been for two years? Lawrence O’Donnell was upset that the dirty hippies hurt Blanche Lincoln in Arkansas in the end. No Larry, Blanche hurt herself being a blue dog Democrat and throwing labor under the bus. The only good thing is now the GOP has their chance to try to govern. Good luck to them and may heaven help us all. They have been saying “No!” for so long they don’t have any real idea what they will do to “give us jobs”. A good spin I would put on it is like a close football game. It is 21 to 20 with 3 minutes left in the game. Your team is behind and is driving down the field. You end up scoring a field goal to move ahead 23-21 but there is 2 minutes left in the game. What then sometimes happens is the other team drives down close enough to kick a field goal and ends up winning 24-23. In my world the GOP is the team that scored too soon since the 2012 election counts more than 2010. One note is that the GOP is not winning as many seats as they did in 1994 when the economy was not as bad as now. This entry was posted in History, Media, Politics and tagged 2010 election, Democrats, economic meltdown, Governor Ted Strickland, John Kasich, obstructionism, Ohio, Republicans, results, tea party on November 2, 2010 by Doug. The 2010 election for the Governor of Ohio is a perfect example, on a smaller scale, of the Republican obstructionism and having no real ideas for governing. The GOP is also supporting a guy with a Mel Gibson short fuse. 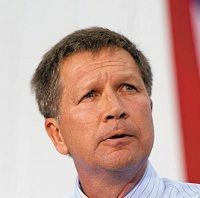 John Kasich, the GOP candidate for Governor, served in the US House of Representives from 1983 to 2001 then left to cash in on his political connections as a contributor to FOX “news” and working for Lehman Brothers – the investment house that collapsed which led to our economy bombing in 2008. While in the House he was chair of the budget committee and helped craft a Federal budget that had a surplus for the first time since 1969. Great news right? Well, not so much.. The surplus was based on financial deregulation, NAFTA, welfare reform, and first the dotcom bubble and then the housing bubble. Basically his “success” was based on the main GOP campaign tool box = pro-business policy, low taxes, and entitlement spending cuts. Fast forward to 2008 and those “good” things led directly to the financial collapse. The bankers played their game and took their obscene paychecks, the housing bubble burst leading to millions of foreclosures, and the collapse of the economy took millions of jobs with it. Kasich wants to do the same thing to Ohio. Yay! Mr. Kasich, who held a “business roundtable” session in Lake Township on Tuesday, said the low ebb of the economy was made clear to him when he stepped out on the eighth floor of a downtown Toledo office building and saw nothing but vacant space. “It was all empty, you know. The most important thing we can do here in this state is we’ve got to create a business-friendly environment so we can get some jobs,” he said. A business-friendly environment is code for no regulations and no taxes – anything less than that doesn’t seem to work for him. “I understand you have a very fine mayor here in Toledo, good guy, independent and all that, but he’s been saying he doesn’t like my program because I want to cut taxes. Well, how are we going to get anybody to come in here if we’re one of the highest-taxed states in the country?” Mr. Kasich asked. Meanwhile the business inventory tax is being phased out, utility poll taxes were eliminated sometime ago, 81% of Ohio companies pay no more than $2000 a year in income tax, you are more likely to see tax breaks given to businesses for negligible requirements on their part, and Workers compensation taxes have been quite low for several years. That really hasn’t changed since then. The state has not added any income taxes and in fact had a 21% tax cut that was being phased in before the 2008 collapse forced the state to delay the last part of the cut. In 2008 Ohio’s corporate tax rate was 5.1% and yet the state is flirting with $8 billion dollars in red ink, cuts in dozens of programs and education among others. In the current two-year budget, Strickland – and the General Assembly – reduced state general-fund spending by nearly $2 billion. In the previous budget, spending was cut by $1.5 billion. He said Mr. Kasich had voted as a congressman against a $1 billion veterans’ benefit targeted for treating head injuries and repeatedly voted for a bill to allow wealthy people to avoid taxes by renouncing their citizenship. Strickland has it right. The so-called 400,000 job loss (really only 379,000 through June) was not Strickland’s fault. He also isn’t responsible for the Republican controlled Ohio Senate that offered no plan to balance the budget and tried to hold onto the final bit of that irresponsible 21% tax cut. He also isn’t responsible for banks holding their bail out money and not lending it out. 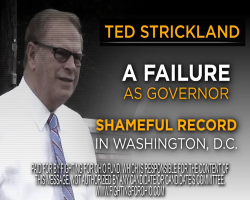 Strickland isn’t responsible for the lack of sales keeping any recovery muted and he sure can’t force businesses to do anything in Ohio until the recession subsides. Kasich doesn’t have any real solution to Ohio’s economic problems. They are much bigger than the Governor and simply “cutting taxes” isn’t going to work. If Kasich wins then Ohio will continue down the road of bad roads, worse education, and increased suffering of people not associated with the big banks like Kasich. Kasich’s “business-friendly environment” plan is the same old same old screw regular people plan that a majority of Americans rejected in 2008 when they gave control of the national government to the Democrats. Why in the heck would we want that failed plan in Ohio. Kasich is just wrong for Ohio. Not to mention he seems to have a short Mel Gibson type temper. This entry was posted in Politics and tagged 2010 election, economic meltdown, Governor Ted Strickland, John Kasich, Lehman Brothers, Ohio, tax cuts, unemployment, Wall Street on July 22, 2010 by Doug. John Kasich has nothing to offer Ohio as governor. The tired GOP talking points have been rebutted and proven they don’t work. Kasich and the RGA has to put out attack ads that don’t tell the truth. Here is a rebuttal, I made, to their recent coffee shop ad. This entry was posted in Columbus, Life, Media, Politics, Television and tagged 2010 election, advertising, Governor Ted Strickland, John Kasich, Ohio, parody, political campaign, Swiss Cheese on May 30, 2010 by Doug.